With crude oil supplies at seasonally high levels, the downtrend resumed yesterday, with US crude losing $0.60 to $100.26. In addition, a strengthening US dollar did not help either, making crude oil look more expensive. Mirroring the indecision in equities, gold prices closed rather flat around the $1,290 mark, despite a stronger dollar which usually puts downside pressure on prices. The lack of clear direction was the result of a balanced speech by the Fed's Chair who managed to keep both sides in check. Surprisingly, the US Department of Energy showed that crude oil inventories dropped by 1.8 million barrels last week, versus expectations for 0.9 million barrels build. That pushed WTI prices $1.00 higher to $100.84, which also reduced the discount to Brent crude oil. Gold investors took the positives from Yellen's speech yesterday, i.e. 'sufficient underlying strength', and feared a continuation of tapering. As a result, they pushed gold $18.3 lower to $1,289.8 as the demand for safe haven assets could plunge. WTI crude managed to recover after sliding on the back of weaker than expected Chinese economic data, gaining $0.49 to $99.87 per barrel. Despite US crude supplies being at their highest levels since records began in 1982, the conflict in Ukraine has managed to put a stop to the recent plunge in prices. Later today, the US Department of Energy will release its weekly stockpiles report which should offer some extra clues on the next possible direction. Despite the weaker US dollar, gold prices dropped $2.3 to $1,307.9 as investors took some profits off the table following two decent rallies. Awaiting the ECB decision on Thursday, some participants decided to stay on the sidelines, happy to play the waiting game for now. After another contraction for manufacturing in China, spread trading investors started to assess how serious the economic slowdown could get. They decided to shoot first and ask questions later, pushing crude oil down on worries of reduced demand in the world's second biggest economy. As a result, US crude lost $0.59 to $99.38. 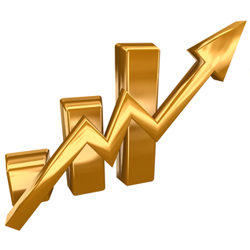 With tensions in Ukraine escalating over the weekend, the demand for safe haven followed suit, pushing gold prices higher. After the precious metal gapped above the $1,300 mark on the open, the market rallied by a further $8.7 to finish at $1,309.7.